Sir Eustace Brackenstall met with a grisly, if appropriate end in "The Abbey Grange." Ultimately, Sherlock Holmes and Dr. Watson let his killer go free. But was Captain Crocker solely responsible for Brackenstall's death? Other individuals were involved with the calm plotting of the aftermath of the death — but whose shoulders bear the ultimate brunt of the guilt in the end? 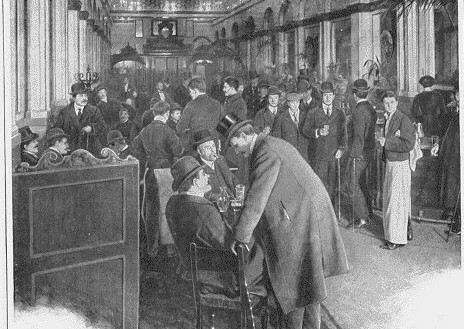 "The game's afoot" as found in King Henry's speech "Once more unto the breach" in Henry V.
Dr. Watson tells us that he and Sherlock Holmes visited one London restaurant two times. 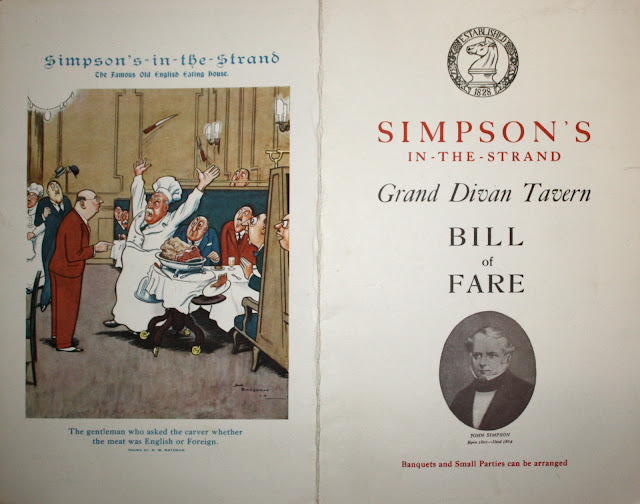 And while the gustatory habits of the famed Baker Street duo are not entirely well-documented, we have a good sense as to what they must have eaten at the famed Simpson's in-the-Strand. This is a case of fact meeting fiction, as Simpson's is very much a real establishment in London — one that was recently in danger of losing its identity. We bring you inside this gem that dates from the 1820s as a cigar and chess divan and explore what dining like Sherlock Holmes was like. Narrator: [00:00:10] Yes the band was speckled and there were six Napoleons, but there are so many other details to pick apart in the stories. Jeremy Brett: [00:00:17] Pray be precise as to details. Narrator: [00:00:20] You know the plots but what about the minutiae? Have you ever stopped to wonder about why Dr Watson was called James by his wife? Or of Sherlock Holmes's dining habits? Or what happened when he let a criminal escape? Narrator: [00:00:38] Scott Monty and Burt Wolder will have the answers to these questions and more in Trifles. Narrator: [00:00:46] Episode 3: Simpsons. Scott Monty: [00:00:50] Hey welcome to Trifles. I'm Scott Monty. Burt Wolder: [00:00:55] And I'm Burt Wolder. Scott Monty: [00:00:56] And this is the podcast where we talk about some of the minutiae in the Sherlock Holmes stories. And in this case we know we've been babbling about for two episodes and boy are we hungry. So we thought what a great time to talk about one of the handful of restaurants that was mentioned in the Sherlock Holmes stories. Simpsons. Burt Wolder: [00:01:20] Oh I thought it was Inspector MacDonald. [00:01:24] It was actually Flanders. Burt Wolder: [00:01:26] No wait a minute didn't Inspector MacDonald have have big old McDonald's boots. Scott Monty: [00:01:31] Old McDonald had a nugget. E-I-E-I-O. That's McDonald's. Burt Wolder: [00:01:39] Oh dear. It's a natural mistake. Scott Monty: [00:01:44] It was the Burger King of Bohemia. Burt Wolder: [00:01:49] Oh, I like that a lot. Scott Monty: [00:01:50] Simpsons on the strand. [00:01:53] It's mentioned twice in the canon first at the conclusion of The Dying Detective when Holmes was coming out of his three day self-inflicted fast and obviously was in need of some food to strengthen himself, when he said "I think that something nutritious that Simpsons would not be out of place." And then again it was mentioned the second time in The Illustrious Client when Watson says I think "I met him by appointment that evening at Simpsons where sitting at a small table in the front window and looking down at the rushing stream of life on the Strand, he told me something of what happened." Have you ever been to Simpsons? Scott Monty: [00:02:44] This is this is one of those occasions where as we talked about last time reality and fiction are intertwined. Simpsons in the Strand is very much an actual restaurant in London. Burt Wolder: [00:02:57] Oh yeah. And has been since the middle of the 19th century is something like. Scott Monty: [00:03:01] That.Yeah it opened in 1828 as the Grand Cigar and Divan a chess club and coffeehouse. And their web site notes that it was to avoid disturbing the chess games in progress that the idea of placing large joints of meat on silver-domed trolleys and wheeling them to the guests tables in the first place came to be. Burt Wolder: [00:03:25] On my first visit to Simpson's I was quite the rube. You know the American rube and I didn't understand any of the customs. But luckily I was with an English gentleman who very politely told me what those customs were and they include tipping the carver. Burt Wolder: [00:03:46] Yes. You have to slip the carver a five pound note would be most appreciative. Scott Monty: [00:03:54] Well what do they gave me the side-eye while I was there. I did not know that. Burt Wolder: [00:03:59] Oh really. Scott Monty: [00:04:00] I did not know that. No sir. Burt Wolder: [00:04:02] It's kind of like tipping the sushi chef. You know when you get to a particular If you're if you're at a sushi bar or something like that sitting in front of you. Scott Monty: [00:04:12] Well I mean I suppose it's a pretty smart practice just in general anyway. Don't don't insult the man with sharp implements. Burt Wolder: [00:04:21] Yeah. It's a wonderful place and I wish I could have known it in the days when there were still cigars and chess games there. But I made it my business to go to Simpsons. It's the Mecca for real British beef and Yorkshire pudding and many other wonderful things and I thought that it was in some jeopardy I thought that within the last year as though there were some rumors that it might be closing down but I don't believe it has. Scott Monty: [00:04:49] I don't think it has yet. I think we had written that up somewhere on I Hear of Sherlock Everywhere at some point. I'll have to take a look and if it is if that is indeed the case we will include it in these show notes. But when you went to Simpsons and you lived in London for a time did you always try to have the same thing when you went there or did you like to vary? Burt Wolder: [00:05:21] It's hard to improve on on good British beef in Yorkshire pudding but you know I had different things in the Simpsons it's kind of like Keen's - you know there's an almost equally old steakhouse that's it's been through several generations, ups and downs and problems, called Keen's steakhouse in Manhattan which is I think at 36th and Broadway and their star signature dish is very expensive mutton chop and it's one of those things that you're never going to find anywhere else. And so whenever you go into the temptation is to have it again and again and again. And it's hard to do better at Simpsons than wonderful roast good British beef and Yorkshire pudding. In fact that's what first convinced me that I wanted to learn how to make Yorkshire pudding and that it was so simple was I felt that I was a fool for way. Scott Monty: [00:06:15] Well that that's how I was introduced to the Simpsons as well. You know the traditional joint of beef as they said that they'd roll the the don't cover the table over to carved for you, table side. There was a place in Chicago. I think it was Lawry's in Chicago that was known for a very similar kind of experience and they topped it off with what they called a spinning salad, where they would before they brought the beef over to you, they would show up with a salad cart. And there balanced and a tray of ice was a large stainless steel bowl and they would put in some romaine lettuce and some parmesan cheese and some croutons and some anchovies if you liked. And then they would start spinning the bowl very quickly and this ice to the point where the ball would remain spinning on its own and then from about two feet up they would begin to drizzle the Caesar dressing into it. Burt Wolder: [00:07:27] A Caesar dressing? Where's the raw egg? Scott Monty: [00:07:32] Oh, well, they already made it. I'm sure the dressing was made with the raw egg. They weren't good they weren't about to make it. Burt Wolder: [00:07:40] Ah, but these are the great old customs you know it's. You still get the rolled out to your table. But also in the old days you'd go to a fine restaurant and they would make a Caesar salad right by the table side as you suggest but using all of the traditional ingredients of course which I think are now frowned upon in some quarters. Yes very terrible. Scott Monty: [00:08:00] Go figure. So you know they weren't that deconstructionist about it but they would do the spinning salad. By the time it was done it would all be mixed nicely. It was wonderful but it reminded me of the traditions at Simpsons. And we did in fact write this up on I Hear of Sherlock Everywhere - ihearofsherlock dot com - that it was about a year ago actually that it was in danger of disappearing after 187 years, because its lease was owned by the Savoy Hotel. And under the search for a new operator for the hotel, the hotel was not going to require that the name Simpsons in the Strand be kept as part of the deal. But looking at their Web site it very much looks like Simpson's is still in existence. That's good to know. Burt Wolder: [00:08:56] So the Simpson's name is owned by the Savoy hotel, so that means that the operator of Simpsons... Well I suppose if there had been anything changed we would know about a new website. Looks like they're working hard to maintain the tradition. Scott Monty: [00:09:07] We would have heard. And that's that's a tough... You know the Criterion Bar is gone. Actually the Criterion Restaurant but that was a much different kind of a beast. I think Londoners would even throw a fit if they knew that Simpsons was going away. Burt Wolder: [00:09:32] Simpsons is an institution. Scott Monty: [00:09:33] It is. It is. Now in the 2016 BSI dinner insert Peter Blau included his usual "Compliments of the Season" and he included in this one a cartoon by H. M. Bateman. And there is a gentleman who is witlessly questioning the carver who has thrown his hands up into the air and the knife is flying. And he's got a look of horror on his face and it's captioned: "The gentleman who asks the carver whether the meat was English or foreign." Evidently that - and all the patrons were looking on, equally as horrified - evidently that cartoon had decorated the bill of fare at Simpsons for many many years. It's from 1972 when joints from the trolley included roast sirloin of beef with Yorkshire pudding for £1.30, whereas today at least this is as of last year. The roast rib of Scottish beef costs £31.80. Burt Wolder: [00:10:47] A bargain. Scott Monty: [00:10:50] I know. Burt Wolder: [00:10:51] You know you know all of this puts me in mind of that essay by Morley. In 1948 the Baker Street Irregulars put out a special edition of The Blue Carbuncle with an introductory essay by Christopher Morley which we have read and discussed in previous episodes of I Hear of Sherlock [Everywhere] - the podcast but in there, Morley observes: "Much has been said about Holmes housekeeping but no one has remarked his passion for meat and bird game. We have we have records of his meals of grouse pheasant partridge woodcock and Patay just won ground cold beef eggs and oysters but he never ate fish. He can't he can't have been English. There was some talk about trout in the Shoscombe Case, but only as a pretext." Isn't that interesting? Scott Monty: [00:11:40] That is. I love that essay. I think we did that on Episode 49 of I Hear of Sherlock Everywhere. He talked of the visiting the pub across the street from the British Museum and walking in and seeing a jambon of ham on the sideboard behind the bar. Just one of those wonderful visuals of English dining life. Burt Wolder: [00:12:16] Well they used to be so many of those I remember in New York. And of course some of these are still going - Keen's bar - they have a very big bar and they've got every single malt whisky in the world. They still put out hard boiled eggs and things like that for the patrons to consume at the bar. And the Cafe des Artists which used to be over by Central Park and also used to have a bar spread like that but it's long gone now. Scott Monty: [00:12:47] Sad. And now you get peanuts and if you're lucky, maybe some pretzels. Well dining was certainly an important part of Sherlock Holmes and Dr Watson's lives and it does creep in from time to time. And you know we talked to Al and Julie Rosenblatt in Episode 103 about making the Sherlock Holmes Cookbook and also in those wonderful dinners at the Culinary Institute of America (the CIA), when they put those together every four or five years. They had to invent some things from whole cloth because dinners were not widely discussed in the canon. There was very limited mentions of food so we're fortunate that Simpsons is among them, having made the grade twice. And knowing that we can actually visit there when we go to London. Clive Merrison: [00:13:46] It is of course a trifle but there is nothing so important as trifles. Narrator: [00:13:52] Please join us again next week for another installment of Trifles show notes are available on sherlockholmespodcast.com. Please subscribe to us on iTunes and be sure to check it out our longer show I Hear of Sherlock Everywhere, where we interview notable Sherlockians, share news and go into even more depth on certain topics. Peter Barkworth: [00:14:14] You take my breath away, Mr. Holmes. The opening lines of A Study in Scarlet are rich with details about Dr. Watson's past. His medical degree, his army service, even his injury. He recalls how he came to London without knowing anyone in the city and proceeded to blow through his cash reserves. The new year usually brings resolutions and offers a new beginning. In our new podcast which begins in January 2017, we thought it was the ideal time to look at optimism in the Sherlock Holmes stories. Was there more hope or despair in the Canon? Certainly, many cases began with despair, but which ones ended in optimism? From "The Stockbroker's Clerk" to "The Copper Beeches," we have clients who were optimistically heading into new jobs. 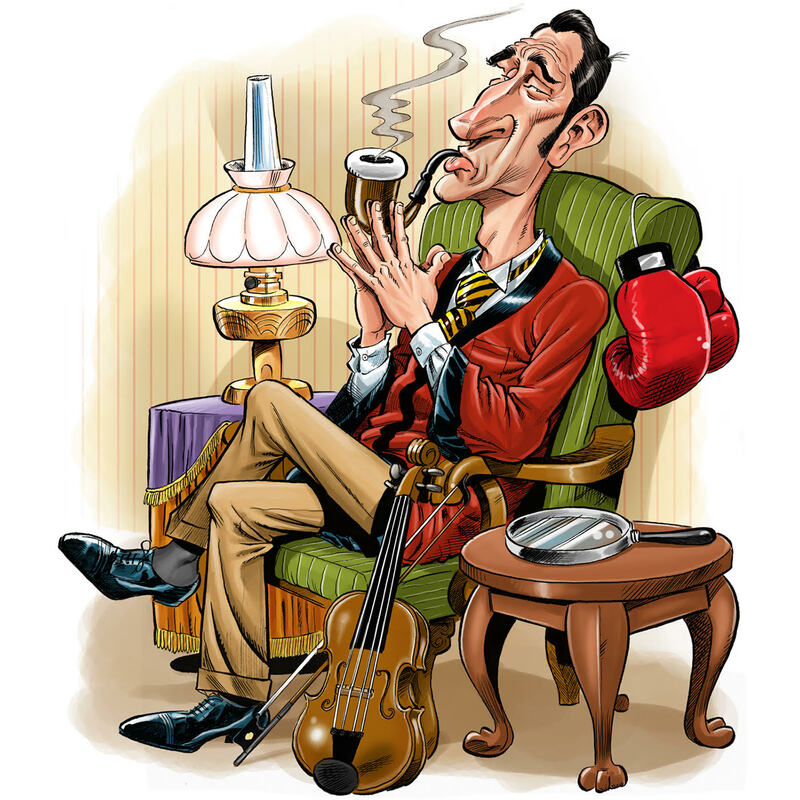 But all was not as it seemed... And what ends well for Sherlock Holmes does not always mean the same thing for his clients. Maria Konnikova on Episode 91 of I Hear of Sherlock Everywhere, discussing The Confidence Game. Special thanks to John Rabe for our intro/outro and to Tom Richmond for our artwork. Narrator: [00:00:10] Yes the band was speckled and there were six Napoleons but there are so many other details to pick apart the stories. Narrator: [00:00:20] You know the plots but what about the minutiae? Have you ever stopped to wonder about why Dr Watson was called James by his wife? Or of Sherlock Holmes is dining habits. But what happened when he let a criminal escape. Dennis Quilley: [00:00:33] You are very inquisitive Mr. Holmes. Jeremy Brett: [00:00:35] It is my business to know what other people don't. Narrator: [00:00:38] Scott Monty in Burt Wolder will have the answers to these questions and more in Trifles. Narrator: [00:00:46] Episode 1: Optimism. Scott Monty: [00:00:50] Hi and welcome to Trifles. The first episode of Trifles. I'm Scott Monty and I'm Burt Wolder and you may recognize us from I Hear of Sherlock Everywhere but even if you don't that's OK because this is a fundamentally different show. We want to delve into some of the details and the Sherlock Holmes stories and we're going to kick it right off since this is our first show of the new year, 2017. We want to talk about things related to new years - in particular, we thought we would touch on the theme of optimism. You know the new year usually brings resolutions, promises that may or may not go anywhere but it offers people a new beginning. Visually, January is represented by the Roman god Janus who was looking back and looking forward. So we wanted to take a look at the role of optimism in the canon. And so Burt I will pose to you. Do you think there was more optimism more hope in the canon or was there more pessimism and despair? Burt Wolder: [00:01:57] Well I think in general more optimism but you know it's interesting that in the cases of Sherlock Holmes very few of them affect only one or two immediately coming to mind encounter characters or people who are about to start something new. However I think that in general the cases of Sherlock Holmes have a tremendous amount of optimism in them because they all represent or many of them represent the solution of the mystery. You know the fathoming of a problem and that is encouraging, rewarding, exciting. Scott Monty: [00:02:39] I mean look the reason people first arrive at Baker Street is usually because there's some there's some problem or some difficulty. But let's think about one person who wasn't a client per se at least not right off the bat but was brought into the case by virtue of a friend of his uncle - and that is Sir Henry Baskerville. Here's a guy who is just off the boat - literally just off the boat from Canada - coming into a major inheritance. One would think that all would be right in the world. And yeah he's heard of this little family legend and whatnot. But as far as Sir Henry is concerned he must be wondering well who's here to rain on my parade. Why is this going on. Burt Wolder: [00:03:32] Well you know it was all very new to him clearly. Scott Monty: [00:03:35] Yeah. And then he goes out to the Dartmoor, he falls in love with his beautiful neighbor. I mean who was you to know that she was married to the guy who was trying to kill him? I mean, he had every good thing though to look forward to. Burt Wolder: [00:03:51] Well you know he does inherit based on his uncle's demise and he immediately meets Dr. Mortimer, who's got some strange tales to tell and then of course there's the missing boot. So mysterious things seem to accrue to Sir Henry early on in the game. I was thinking of. I was thinking of the Stock-broker's Clerk - you know, Hall Pycroft who is who is taken advantage of by a very clever villain because he's just starting something out you know he's going after this new job. You know which I think is very telling because so many of the villains in the canon are people who understand that connecting to their marks' hopes and dreams is really important. And so people like Hall Pycroft are taken advantage of. But then I guess you could say Sir Henry's taken advantage of as well. Scott Monty: [00:04:51] Yeah, although not in my mind it was more of a nefarious way rather than just a gift or a con. Our friend Violet Hunter from The Copper Beeches - very much the same - she was seeking a new job. Burt Wolder: [00:05:09] She was in desperate straits. You know what sends her back to that. That I'm trying to remember the name of the woman who runs the bureau trying to find governess's work what would send her back there as she goes back to her flat and realize as you know that she's really running out of money. Burt Wolder: [00:05:31] Ms. Stoper How about that. Scott Monty: [00:05:37] Yeah well that's that's true. And in doing so she accepted a position that was many times the going rate. Burt Wolder: [00:05:50] Yes that really seemed too good to be true. Burt Wolder: [00:05:54] And the interesting thing about her is that she wasn't you know she wasn't the sort of woman to say oh well look at my good fortune I'll just take advantage of these gullible people. She was smart enough to say I don't think could be. Something's not right here. I better consult someone now. How about this fellow Sherlock Holmes? Scott Monty: [00:06:14] Well then we had a we had a similar issue with regard to being able to get someone a half wages that cheapskate Jabez Wilson and The Red Headed League was able to do. Burt Wolder: [00:06:28] Oh right. Burt Wolder: [00:06:29] So kind of looking at it from the other way around that boy he's happy because here he got this help he came for half wages and then all of a sudden he's got an opportunity to to come in to some money simply because he has red hair. Burt Wolder: [00:06:43] Yeah well that's why Violet Hunter is somewhat unique I mean we're sort of off topic here in terms of optimism but she's somewhat unique in the canon in that she is a well-rounded thoughtful person with good judgment who encounters who seeks out homes because you know she just wants to be sure about something. The vast majority of people that Holmes encounters are you know don't don't really fit that profile and Jabez Wilson is one who presented with this violent hunter like opportunity this gift of this steady paycheck says to himself, "Yes makes perfect sense to me. Thank goodness non-qualified Where do I have to show up?" Scott Monty: [00:07:28] Yeah Yeah. That's that's a good point. Burt Wolder: [00:07:34] But you know the interesting thing about all of this is that it shows you how human and sensitive and observant. If one wants to presume that the literary agent had something to do with all of these stories - that the author is because he's so attuned to these human foibles and opportunities and what happens when people encounter something that might be too good to be true and what the real motivations are and what how might appeal to various people. Scott Monty: [00:08:08] Very astute at that. And every one of the situations I think was eminently believable. We could all picture ourselves in a situation like that being offered something or having an opportunity to do something and the brain is funny that way - the emotions take over. And I think it's human nature to at times look at the world through rose colored glasses. And when when an opportunity is offered we usually don't think ill of our fellow man. We tend to believe that people are generally good and that can lead a few unsuspecting naive souls astray because of that what we saw that time and again. Burt Wolder: [00:09:01] Well you mentioned earlier mark and grifter you know and that harkens back to our conversation that I Hear of Sherlock with Maria Konnikova, who in addition to her How to Think Like Sherlock Holmes also had a book called The Confidence Gamein which she distilled the essence the mechanics of confidence games and tricks like that - and so many of those those characteristics are afoot in the literature of Sherlock Holmes, in Sherlock Holmes cases. In the case of Hall Pycroft the Stockbroker's Clerk an in Violet Hunter and in The Solitary Cyclist and many more. Scott Monty: [00:09:41] Now if you're not familiar with I Hear of Sherlock Everywhere - that's the companion podcast you can check out the episode with Maria Konnikova by simply going to the URL ihose.co/ihose91, you'll find the Confidence Game episode with Maria. Now there's one that certainly involved anything but hope at the outset. But I think we're well we're left with mixed emotions at the end of it. But I think there is hope after all and that is - again not a not a real mystery to be solved here; there was no crime committed at least in the in the case of the client in present day. But that is The Adventure of the Veiled Lodger. This is one of those human tragic stories. Mrs. Ronder, whose face was mauled by the lion at the circus, was contemplating suicide. And I think what we were left with at the end of it was not only a stern rebuke and warning from Holmes, but perhaps perhaps some hope that this woman would not take her own life and that she would continue to live as sad a life as it was. There perhaps was a glimpse of optimism for the true humanists out there. Burt Wolder: [00:11:25] Well Holmes reminds her that life is worth living and in the end you're left with the very strong impression that she's not going to do herself and which is very positive. But I don't know that I would say that case ends really with any optimism. Scott Monty: [00:11:42] Well it certainly ends better than it begins. Burt Wolder: [00:11:45] Big cases that end optimistically I think The Sign of Four ends optimistically - Watson found the love of his life. Scott Monty: [00:11:55] There's there's another one involving an inheritance and it ends very well for Mary Morstan and John Watson. Burt Wolder: [00:12:03] And you know here's something to think about I mean the cases that end well for the participants versus the cases that end well for Sherlock Holmes. You know the cases that end well for Sherlock Holmes - in addition to the cases that end with him putting a sizeable check in his pocket - are those cases that come to mind like The Six Napoleons where he you know he's really appropriately praised by his colleagues, which is not something that he's he's used to. As opposed to cases that end well for his clients or not. When I think of people like poor old Hilton Cubitt who without too much of a spoiler alert and up as it were deceased. Scott Monty: [00:12:49] Yeah. That that was very tragic there. 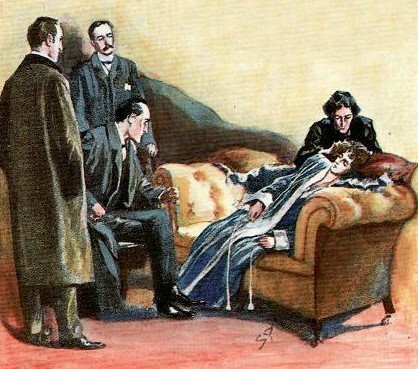 But you know The Six Napoleons, I've always always enjoyed that because you see just a brief crack in the unfeeling exterior of Holmes when Lestrade said "Well, I've seen you handle a good many cases Mr. Holmes but I don't know that I ever knew more workman like one than that were not jealous of you down at Scotland Yard. No sir. We're very proud of you. And if you come down tomorrow there's not a man from the oldest inspector to the youngest constable who wouldn't be glad to shake you by the hand." "Thank you!" said Holmes. "Thank you." And as he turned away it seemed to me that he was more nearly moved by the softer human emotions than I had ever seen him. A moment later he was the cold and practical thinker once more. Burt Wolder: [00:13:55] It's lovely. But see isn't that the fun? Having regular sort of a conversation about the details of the canon - if you spend the time and read the 56 short stories and the four novels you wind up with a memory of these lovely incidents and it's so much more detailed than simply having a list of quotations. When you think of Robert Louis Stevenson and you think of Jane Austen another lovely little lines of dialogue and great little memorable moments but there does seem to be a rich store of things that are worth recalling in the cases of Sherlock Holmes. Scott Monty: [00:14:37] Something I think about. Well friends we will leave you with that thought until we see you here on Trifels next time. 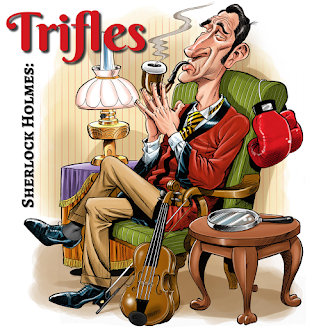 Narrator: [00:14:47] Please join us again next week for another installment of Trifles. Show notes are available on sherlockholmespodcast.com. Please subscribe to us on iTunes and be sure to check out our longer show I Hear of Sherlock Everywhere, where we interview notable Sherlockians, share news and go into even more depth on certain topics. Peter Barkworth: [00:15:09] You take my breath away, Mr. Holmes.